Medical Conditions Spangler was rumored to be three months pregnant at the time of her disappearance, but this has not been confirmed. Spangler was an actress and a dancer mainly noted for small film roles in the 1940s. She left her home in the Wilshire district of Los Angeles, California on October 7, 1949 at approximately 5:00 p.m., en route to a farmer's market. She lived with her young daughter, Christine, her mother, her brother and her sister-in-law at the time. Spangler told her sister-in-law that she was meeting her former husband, Dexter Benner, to discuss a possible increase in child support payments on his part for Christine. His child support was a week overdue. A photo of Dexter is posted with this case summary. Spangler said that she was scheduled to report to a nighttime film shoot after the support meeting. Spangler's sister-in-law filed a missing person's report with the Los Angeles Police Department after Spangler did not return home by the following day. A Griffith Park employee found Spangler's purse, with its contents intact but its handles ripped off, on October 9, 1949, two days after she disappeared. A photo of the purse is posted with this case summary. The purse was located near the Fern Dell entrance to the park in Los Angeles. A note stating the following message was found inside: "Kirk -- Can't wait any longer. Going to see Dr. Scott. It will work out best this way while Mother is away,"
Investigators questioned Dexter about the night Spangler vanished. Dexter claimed that he did not meet with his former wife that evening as she told her sister-in-law; his statement was substantiated by his current wife at the time. Dexter maintained the last time he had seen Spangler had been weeks prior to her disappearance. The motion picture studios in Los Angeles reported that night shoots were not scheduled for any film production the night Spangler disappeared, contradicting another statement Spangler made to her sister-in-law. A friend of Spangler's told investigators that Spangler informed her that she was pregnant before she disappeared. This announcement led to speculation that the Dr. Scott mentioned in the note was a physician who performed abortions, which were illegal in the United States in 1949. Authorities investigated the majority of doctors in the Los Angeles area, but the identity of Dr. Scott, if he indeed existed, remained elusive. Police did have one lead into a possible suspect; a former medical student who frequented the Sunset Strip section of Los Angeles performing abortions for fees. The unidentified individual's nickname was Scotty. He was never located or questioned about Spangler's disappearance. Spangler apparently had numerous affairs or relationships with men in the Los Angeles and Palm Springs, California area in the ensuing years. One of the men was David Ogul (nicknamed Little Davy), an associate of organized crime figure Mickey Cohen. Palm Springs had been known as one of Cohen's favorite partying spots in 1949. Witnesses told investigators that Spangler and Ogul were seen in the Palm Springs area the week before Spangler vanished. Curiously, Ogul himself had disappeared only two days prior to Spangler; he had been indicted on conspiracy charges shortly beforehand. 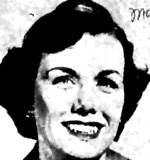 Twists in Spangler's case continued into February 1950. United States Customs agents in El Paso, Texas informed Los Angeles detectives that they may have spotted Spangler with Ogul and another Cohen associate, Frank Niccoli, in a hotel. Niccoli was indicted on similar charges as Ogul and had disappeared from California in September 1949, leaving authorities to find only his car keys on a street. A hotel employee identified Spangler from a photo as the woman who accompanied the fugitives in Texas. Customs officials believed that the three were headed to Las Vegas, Nevada, but nothing developed from the lead. Spangler was born in Seattle, Washington and graduated from Franklin High School. She married Dexter at age 19 and filed for divorce six months later, accusing him of cruelty. She and Dexter continued to see each other off and on for the next five years, however. Their divorce, which wasn't finalized until 1946, was messy and involved a bitter custody battle over Christine; Dexter got custody of the child, and Spangler alleged that afterwards he prevented her from seeing Christine on 23 different occasions. A judge granted custody to Spangler after two years. Sightings of Spangler continued over the next few years in California, Arizona and Mexico, but nothing concrete was found. Dexter was granted custody of Christine after Spangler failed to reappear, but his new wife was not allowed to legally adopt the child due to Spangler's undetermined fate. Spangler's mother got a court order granting her visitation rights to her granddaughter, but Dexter repeatedly defied it. When ordered to serve 15 days in jail as a result, he took Christine, left the state and never returned. Spangler's case remains unsolved; there's been no trace of her since 1949. Updated 6 times since October 12, 2004. Last updated November 13, 2013; two pictures added.